WebCheck is a suspicious application. If you visit webcheck1.com, you will be assured that the program is ‘100% genuine’ or ‘Secure’. The official download page represents the program as a tool which is meant to secure your browsers and prevent different threats while you surf the web. The application is meant to block the pages which are set to steal personal data and block the attacks associated to phishing scams. Even though it is necessary to guard the operating system and the web browsers against malware, it is also important to guard it against unreliable software that requires removal. Continue reading, and soon enough you will learn why we recommend having WebCheck removed. 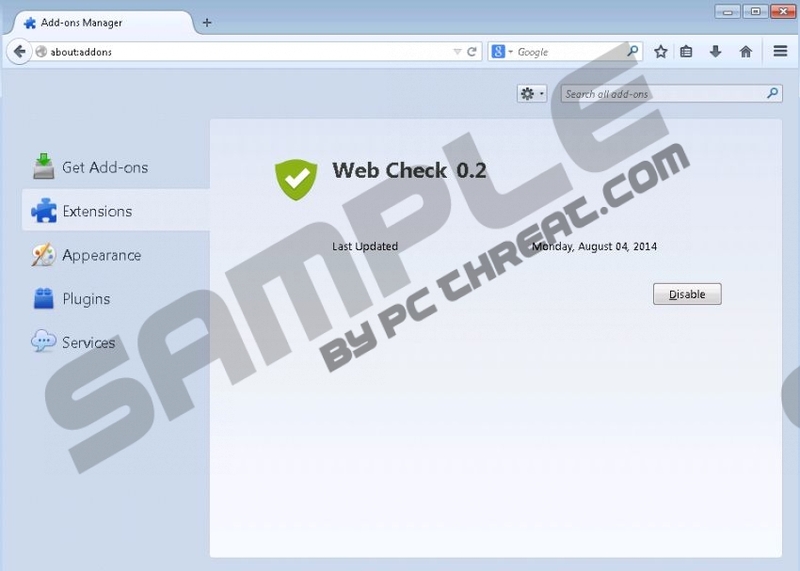 As researchers at pcthreat.com have discovered, WebCheck may travel packaged with other programs. This is not necessarily dangerous; however, you must recognize that not all applications may be reliable. This risk prevails even if you download authentic software using software bundles. If you want to prevent the potential infiltration of unreliable software, you should not trust software bundles. Ultimately, if WebCheck has been installed with other software, we suggest you inspect it to figure out if you should delete it from the operating system. Utilize a legitimate malware scanner to figure out which applications you must remove, and which are harmless to your virtual security. Have you ever deleted adware on your own? If you have, you must know that sometimes it is not enough to uninstall adware to remove all components. You may need to remove remaining files and web cookies individually if you choose to delete WebCheck manually as well. If you have no experience with the processes of manual removal or if you do not want to waste time tracking down adware components, we suggest employing legitimate and trustworthy automatic malware removal software. If you do not remove WebCheck, you can expect different ads to flood your browsers and disrupt your activity. Right-click on the screen of the Metro UI menu to open a pane at the bottom. Select All apps to open the Apps menu and then select Control Panel. Open the Start menu (click the Windows button on the Task Bar) and select Control Panel. In the menu select Uninstall a program to find the list of available application. Navigate to the Task Bar, click Start to open a menu and select Control Panel. Quick & tested solution for WebCheck removal.